Here's a new theory. The one who named Elmer Fudd had the Elmer and Fiddle/Fidelow and/or Fido surnames in mind, while Daffy Duck was code for Daphne, the Taphians (Greece) who founded the Safini/Sabines of Abruzzo, in and/or beside Rimini. Wikipedia's article, on Elmer Fudd's creation, says: "evolution from Tex Avery's Egghead, Chuck Jones." That is, Elmer was the work of Chuck Jones, of Merrie Melodies, director also for Daffy Duck. Well how do you like that. I had traced the Mary Magdalene cult to the Merry/Meret surname (with Merrie variation!) merged with the D'Allen/Alan-of-Dol surname. Keep this in mind as the Elmer surname is traced (below) to the red lion of the English Stewarts, for the Merrie surname uses crowned red lions (i.e. representing a family that made it, somehow, to royalty). BEHOLD, that cartoons ARE tools for us to use in unraveling secret Masonic bloodlines, for the Elmer Coat uses the ravens of the Jones Coat!! The English Elmer Crest uses an axe, the same design as the axe in the Jones Crest! The Elmer Chief uses a blue dolphin, which we have seen before as linking to Daphne-based Devon and Deva/Daven (= Cheshire) elements, but traced back to Taphians. There IS a (Welsh) Daffy surname first found in Cheshire!! It's the David/Dewi surname of Obama's true father, Frank Marshall Davis. The David/Daffy Coat uses "copia" in the motto term, as does the Arms of Macclesfield Borough. BEHOLD BEHOLD BEHOLD. There is another Welsh David/Davis Coat, same as the David/Daffy Coat, using the Jones motto!!! That's proof that the creator(s)/director(s) of Elmer Fudd and Daffy Duck was honoring his/their own bloodline(s). How many other Loonie Tunes or Merrie Melody cartoon characters do likewise? There IS a Looney surname, a variation of the Cluneys, a family first in Perthshire that belongs to ones using keys, for example the Abruzzo-based Sheaves as they evolved into Shays/Shaws; the latter's English branch has a Sheaves variation while the Scottish branch were first in Perthshire! The Clunys/Looneys are obviously related (as per the sharing of Shields) to the Irish Looneys (shows no "C" variations). The Davis' were first found in Flintshire, next to Cheshire. The red and white colors are possibly those of the Flemings. Fred Flintstone depicted red-and-white Flanders/Flinders elements, as Wilma (dressed in white with red hair) represented red-and-white Fleming/Vlaam elements; note the Fleming motto: "Let the deed shaw," for Shaws are about to be discussed yet again. The Fleming border was used also by Thomas Randolph, first earl of Moray (see Wikipedia article), and descended from Meschins of Cheshire. There is an Irish Taffey/Taffie/Taaf surname with what should be the Macclesfield cross, where the cross is filled with a blue lattice as per the blue Macclesfield lion. The Avery/Averary surname (i.e. another creator/director of Merrie Melodies and of Elmer Fudd) is in the colors of Abreu and Vere, and smacks of "Ferrari." The gold-on-red roundels in the Avery Coat are shared by the Clampet surname. At the Daffy Duck page, the two creators are listed as Tex Avery and Bob Clampet! Voices in the Daffy cartoon include Mel Blanc. The German Blanc Coat has a castle design almost exactly like that of the English Fort surname, while the French Blanc Coat uses white lions, as per the German Forts. There is an alternative Blank surname using a lion in the Ferrari colors. The Blanc/Blank link to the Forts, from Fortibus, should explain why the large cinquefoil of the English Blanks is virtually identical with the Bus cinquefoil. Dutch Blanks use the hammers of the English Somes, a surname I thought to link to "Tonebrigg." The Elmer Crest is the bird used by the French Forts, but also the bird used by the Kay and Kenner clans of Arthurian importance. The surname is also Ail(mer) and Ale(mer), smacking of Ayrshire's old name, Aleshire. Hmm, the English Ale Coat uses a white lion on blue, the symbol of the German Forts...same as the Welsh Jones'! I had traced the key symbol of various clans (e.g. Sheaves) to Shaws/Shays of Ayrshire, and then realized that the key symbol of the Kay Crest reveals the Kays to be a hard-C Shay variation. That fits. I do not think I have ever found the Shaw branch in Ayrshire, aside from circumstantial evidence and the assumption based on the Ayrshire motto, "God Shaw the Richt," but now there is the added idea that Kays were merged with the Ales of Ayrshire. The Aleshire surname was first found in Kintyre (beside Bute and off the Ayrshire coast) and uses the motto of the MacDonald clan, "Per mare per terras." I trace the Ales clan to the Ale river of Roxburghshire, where the Rutherfords lived...whom I trace to the Rothes (known to be linked closely to the Renfrew Pollocks) who I think named Rothesay, the early name of Bute. The Elmer/Aylmer surname was early Elmari, reflecting the Ale motto. The Shaws were traced to the Sheaves/Chaves of Abruzzo. The Italian Ales surname uses the Abreu/Abruzzo wings! I've known that the Italian Ales topic would come up again as important, but at the time, the fact that it was first found in Messina had no importance to me. Since then, Massino elements in Piedmont have been traced solidly to Messina! More on the Ales/Alicia surname later, when the time is right. No Fudd/Fud/Fodd Coat comes up, but I am reminded of the Flood surname mentioned above with "Vis" and "fortior" motto terms. The Elmer motto is "Hallelujah." Hmm, the Hall/Halle Coat (in Elmer colors) uses Labs called "talbots" (tracing to the Meschins Talbot bloodline). The surname is also said to be "D'Aule," which may have been the earliest as per "Ayl/Ale." The English Hull Coat is virtually identical. The Halls were first found in Lincolnshire, where Ranulf le Meschin's wife, Lucy Taillebois/Talbot, held estates!! Therefore, the Elmers/Aylmers indeed used "Hallelujah" as code for the Halls/Hulls. The Swedish Halls use a symbol that I've been looking for years; it's the saw-like symbol used, in the same position and colors, as in the English Stewart Coat (these Stewarts were directly from Dol, moving to Shropshire where Meschins were first found). Hold on to your chair. The German Halls use the same red and gold colors as the Swedish halls, with a similar Coat, wherefore they are related to one another...and to the DUTCH Hall Coat, a red triple chevron on gold like the Clares... and the DUTCH Burghs (coat no longer shown at houseofnames.com, but, on my life, I saw in many many times)!!! As we can see a star at each tip of a chevron, so the same format is used in the Cassane Coat. That surname (as Casain/Cussane) is roughly the Patterson alternative...which I trace to "Guis/Goz." Therefore, with Pattersons solidly linked to Meschins, who were indeed from the Goz surname (= Ranulf le Meschin's mother), I would link the Cassane triple chevron to that of the Montfichets/Muschets (same colors and shape exactly), for Ranulf's son was styled, "de Gernon," while that surname was from Gernons of Montfichet. Apparently, the surname was fundamentally "Muschet," while certain Muschets later took on the name of the town when moving/living there. If the question is whether Muschets can be traced to Clare of Suffolk, where the red triple chevron on gold was the symbol, the answer is, "YES." For the Muskett/Muskatt surname was just re-found; it's also red and white, and the family was First found in Suffolk where they held a family seat as Lords of the Manor." The Musketts were named after Mousquette, Normandy, which is where the Muschets must have lived also. The write-up goes on to say the Musketts were lords of the manor of HAUGHleigh. The English Hough/Hoff surname was first in Cheshire (! ), and has a wolf-head for a Crest!! Not only is it roughly the wolf-head design of Hugh D'Avranches, but the write-up seems to trace to "Hugh" himself: "Furthermore, the name Hoff may be derived from residence in one of a variety of similarly named places: Hoe is in Norfolk; Hoo is in Kent; places called Hooe are in Devon and Sussex; Hose is in Leicestershire; places named Heugh are in Durham and Northumberland; and settlements called Hough are found in both Cheshire and Derby." The Cassane motto term, "alis," could be code for the Elmer/Aylmer bloodline. The Cassane Coat uses a red box in the top-left corner of the Shield, which symbol can be traced to Merrie-et-al surname. As the Merrie surname derives from Meret in Normandy, see the Merot Coat, a copy of the Scottish Bruce Coat...using a white square in the top-left corner. THEN SEE the Meret-surname Coat (of Meret, Normandy i.e. it's a Merrie variation), for this family includes "LaMere," so close to "Aylmer" that Elmer Fudd must be code for the Mari (goddess) cult. In fact, the Meret/Lamere Coat is in the colors of the English Elmers, where the write-up traces to "Almari." I don't think that "Elmer\Aylmer" can derive from both "Meret" and "Ale." Possibly, the evolution of terms was Meret>Lameret>Lamere>Aylmer>Ale. The Meret Coat is a copy of the Mertone/Murton Coat, which surname I tend to link with "Moretin," i.e. from the Mauritanians. The Coutance Coat uses a pine tree, same design as the Ficthen/Fichtel tree!! The latter tree has nine pine cones on the grass. Now I get the Alis code in the Cassane motto. It's for the Elis surname, using the disheveled blonde woman, Holle, a goddess equated with Mari, the Basques goddess. I once showed an Elis Coat with the same fish-tailed woman (also a blonde) as per the Massin Crest. There is a blonde woman also in the Elm/Elmes Crest (i.e. looks like an Elmer variation). The Elmes and Elis Coats both have some similarity with the Bugs Coat, the point being the Bugs symbol, not a carrot nor a doc, shucks, but the symbol central in the Banister Coat. Recalling that Banisters trace to the Banes family, let me re-show the French Banes Coat, a red triple chevron...just like the Cassane Coat with Alis motto code. The English Banes were first found in Yorkshire, as were the Elis', and meanwhile the write-up in the Meschin page: "...Ranulph, 3rd Earl of Chester, who...held the honor of Skipton, in Yorkshire, from Richard Banistre, a Norman Baron of Cheshire..."
I entered "Doc" to get the Doak Coat, using white cinquefoils on red, the symbol of the English Blanks; Bug Bunny was originally voiced by Mel Blanc! For those too young to know, Bugs Bunny is famous for his line, "What's up doc," which he spoke to his adversaries, including Elmer Fudd. "According to Bugs Bunny: 50 Years and Only One Grey Hare, he was 'born' in 1940 in Brooklyn, New York, created by Tex Avery (who directed A Wild Hare, Bugs Bunny's debut) and Robert McKimson (who created the definitive Bugs Bunny character design), among many others. According to Mel Blanc, the character's original voice actor..."
McKimson? That looks like a Simson variation. The Simson Coat uses "Alis" in the motto, has white crescents like the Elis Coat, and was first found in Nottinghamshire, as was the Bugs surname! Speaking of green, which the Kimson Coat also uses, see the Hare Coat again...a green snake in a red fox's mouth. I did say that this very fox is a symbol of the Samson cult, and, independent of that thought, I figured that the Simson surname is a Samson variation. The theory looks like it's working here. I've sensed for some time that I'm destined to be back to the German Wilder/Wild Coat...because it uses the Ales surname tree. The Wild Coat uses a "savage...supporting a tree. The Crest of the English Wild/Wilder surname is also said to be a savage. I think this term will end up linking to the Savage surname, and the Sara/(cen) entities thereof. You may recall that I link the Savage surname round-about, but reliably, to the "sara" motto term of the Russells, while the Russells were linked to Pattersons...and the Pattersons/Cassanes to the Ales surname. NOW, is it a coincidence that the Ales surname was first found in Messina (east Sicily), where the Saracens warred before they ended up in Milan with the green-snaked Viscontis??? The sara code was identified with those very Messina>Massino Saracens, do you see how nicely this works, and how much work has gone into keeping track of families/bloodlines through their heraldic codes? I'm of course bringing up the Wild surname because Tex Avery "directed A Wild Hare, Bugs Bunny's debut." THEREFORE, oh ye of little faith, see how the English Wild Shield is the Bugs Shield! ...Schlesinger's hiring of Frederick 'Tex' Avery, Carl Stalling, and Frank Tashlin further increased the quality of the studio's output. He later added Bob Clampett, Chuck Jones, and Mel Blanc, and collectively these men created such famous characters as Porky Pig, Daffy Duck, and Bugs Bunny." The Schlesinger surname was first found in Silesia (Poland), as was the Wach surname, while the Peski surname was first found in Poland. The latter two surnames are mentioned because Elmer Fudd called Bugs a "pesky," as well as a "wacky," wabbit. I wouldn't have mentioned it except that the Peski Coat uses an arrow above a white crescent in the same fashion as the cross above a crescent in the Wack Coat. Schlesinger was named in honor of Silesians (German = "Schlesien"). Why leopards in the Sclesinger Coat? Leopards are supposed to trace to TranSYLVANia, BUT, the English Sylvan Coat is almost the Schlesinger Shield. AND, recalling my trace of Moravian Transylvanians from Oradea (= a Rus-founding place) to the Flemings (of Flander's founding), I'm now shocked to find that the Silvans were "First found in Nottingham where the family name is descended from a Norman noble Joceus le FLEMANGH [caps mine] who accompanied William the Conqueror into England and was granted part of a knight's fee at Cuckney in that shire." The Bugs' were first found i Nottinghamshire! The Silvan motto includes "mourant," smacking of the Mures river on which the Marot-named Hebrew Khazars lives, who I think were Moravians by nationality, and linked to Moray, Scotland, which was also called "Moravia." I traced these Marots to Meret i.e. the Merrie family in Normandy and beyond. Therefore, see the three white stars, in Moray-star fashion, in the Scottish Stive/Steven Chief (motto uses "Coelum," traced to the Polish royals). I had traced the Moray-Crest scroll to the scroll in the Arms of Bihor/Biharia (capital = Oradea). Why do I show the Stive Coat?? Because, I was writing on the Schlesinger and Silvan Coats above while All In The Family was on television...and the Polish "meathead" of that show acts as a Pole; his surname, in the show, is Stivic. I couldn't find a Stivic Coat, but knew there was a Stive Coat. The surname includes a Stimpson (Simson?) variation, and the English Stimpson/Stimson Coat also uses leopards! I had traced the Biggar surname of the Flemings to "Biharia." I've just learned that the Biggar Crest is a pelican head. The Biggars were first found in Lanarkshire, which uses red hearts. See the red heart below!! The French Silvan surname includes Sauv-using variations, a term at the roots of the Sarah/Saire/Sayers surname (leopard in Crest!!) that links to the "sara" motto term of the Russells. Like I said, Oradea was founded by Rus stock (because it traces to Arados, Syria, where the Rhodes-based Rus also trace), and so here in the Silvan/Sauvan family we find a potential Saracen family just where it's expected, merged with Rus. I'll explain the unlikelihood of Transylvanian Saracens below. The logic works like this: Saire>Sayer>Saier, wherefore we check the Saier/Sauer surname to find in the write-up that it's linked to the Sau (also "Sava") river (Austria). Entering "Sava" brings up the Scottish Sauvage/Savage Coat. Entering "Savage" does not bring up the French Sauvage Coat, but it's a red heart!! Just a big red heart on white, nothing more. See the same heart in the Arms of Lanarkshire, and know that the Meschins of Cheshire trace to Moray through Lanarkshire's Blackwood clan. The Silvan/Sauvan family was "First found in Poitou, a part of Aquitane, where the family has been a prominent family for centuries, and held a family seat with lands and manor. The family were well established in the region of the Vienne..." We then find Sauviat-sur-Vige in the Haute-Vienne department, smack beside Poitou. The people of Sauviat-sur-Vige are called "Sauvigeois." The term does not mean "savage," as in a wild man, apparently, but is a Sauv-Vige combination. How can these Silvan/Sauvan clans be Saracens when Saracens are classified as Arabic? Because the Rus are part-Arab. I trace Arados, called "Arvad/Arpad" to the local Syrians, back to the very-ancient Assyrian city of Arrapha/Arrapachitis, also "Arabkha," and its namers were the Biblical Arphaxadites (proto-Hebrews), but they were also the true Arabs as per the Arabkha spelling. That has been my strong feeling, and contention (due to some sound "circumstantial evidence"), long before Saracens became a topic. I had understood that Arphaxadites represented the mythical dragon symbol of Ares, wherefore Arphaxadites were a main part of Thraco=Thracians. Totally independent of that trace, and years later, I figured that "Saracen" derived from "Thraco." It works. Saracens were part Arab, part Turruku, but also part proto-Rus. The English Silvan Crest is a green dragon probably for that reason. After writing that, the Draco-surname was checked: a green (wyvern) dragon!! The Drake Coat motto uses the phrase, "captat muscas," evoking the copia motto term of the Arms of Macclesfield (anciently, "Makeslesfield") Borough, which place was likely named by the Maccus variation of the Maxwells/Maxtons. I had never tried for a Musca Coat, but seeing it in the motto, I tried it...and got a leopard. Variations include Mosca, Moschi, and Muscas, evoking Moscow and the Mushki variation of the Meshech allies of Gog, but we also see 'l' variations such as "Moschella" that should link with the 'l' versions of the Shropshire Meschins, and in fact another Musca variation is "Moschini." The Maschi/Masskaly surname of Rimini (Italy) is evoked by the Musca clan, but the latter was first found on the opposite Italian coast (Pisa)...and meanwhile the Drake motto starts with "Aquila," capital of Abruzzo. The Drake Crest is an axe, a symbol that should trace to southern Italy i.e. close to Crete. It was the symbol of mythical BritoMartis of Crete, but that term should trace to Bruttium...and Aprutium, the old capital of Abruzzo. The Hyksos on Crete? Yes, probably among its Minoans, for the Hyksos worshipped the Egyptian Min/Amun (who I trace to the Manes>Attis line of Azzi Armenians). I see Europa, the mythical mother of Minoans, as Ebr(opa), and therefore a possible root of the Eburovices (they lived in northern Italy too), whom I link to "Abreu/Abruzzo." In this picture, the harlot of Revelation 17 is the Abreu cult of Europe's founding, though in a local way the harlot represents all the co-founders of the Romans, the Sabines included (Abruzzo was Sabine territory). The Sheaves were first found in the Abruzzo capital, Aquila, which is the city honored by the Vere dragon cult as per it's Drake (= dragon) surname (see later in this update). It's all coming together because the dragon-cult Veres, as per Nicholas de Vere, claims that Veres trace from the ancient Mittani Hurrians to the Danann and then the Picts, while both the Cluney-Loonies and Shaws (not to mention Maskalls) are said to be from Picts (though of course they can trace to other peoples as well). I suspect that the Mittani named Methoni/Modon in Messene (Greece), you see, and Messina in Sicily is thought to be named after Messene, while it then leads to Massino in Piedmont...where we find the green snake/dragon cult, the symbol of a Vere Crest. Look at what was just found. As per the Chiava (means "key" in Italians) variation of the Italian Sheaves, I found a Keeves\Keever variation registered under the Ivor/Eure surname; it uses the Vere Shield and the Vere symbol, a boar, in the Crest. What this suggests is that Eure and the Veres were named after the same Eburovices elements, for I am sure that the boar is a symbol of the Abruzzi=Eburovices of northern Italy who moved to Normandy (named Evreux, for one), where Eure is found and where Veres lived. The department of Eure-et-Loir uses a red triple chevron on white (see previous update for significance). See also the German Keever/Keefer Coat, with the same pine tree seen regularly recently. Entering "Buro" gets the English Burgh Coat with "fide" motto term. Does it not make sense that the Burghs should also be Veres, especially where the Burghs appear (two days ago) involved with Tonbridge? The online Vere work entitled, "From Transylvania to Tunbridge Wells" (a location close to Tonbridge) is where I learned that heraldic leopards are symbols of Transylvanian entities. I've not spent much time reading this work, but the idea is that Veres trace to the Wells surname linked to Tonbridge, which was a variation of the Vaux surname from Normandy. Here's some the Vere write-up: "In the Domesday Book, Aubri De Ver was one of the great landowners of England and held his castle from the King at Hedingham in Essex. He also held Kensington a suburb of London. He was ancestor of the Earls of Oxford." Hedington? It reminds me of the Haddington location where the Keiths/Maskalls were first found. The write-up for the Scottish Vaux clan: "They possessed...the barony of Dirletoun in East Lothian." Haddington and Keith (and Musselburgh) were also in East Lothian! The Arms of Oxford? A grey elephant. The Mascall/Maskal Crest? A grey elephant!!! The flag of Liguria? What looks like the elephant in the Republican logo! As proof that the namers of Musselburgh were Kieth-based Maskalls, or elephant-using Maskals (one 'l'), there's the Muscel variation of the Mussel surname. THEN, looking up "Hatting" just now, we find that they (also "Hatton") were first in Cheshire (!! ), suggesting a trace to the Meschins there. IN FACT, the Hatton write-up: " First found in Cheshire where they had been granted lands by the Earl of Chester..."
BUT, it now dawns on me that "Keith" is a variation of "Hed(ing)," but if not quite then it's a variation of the Chedel/Cheatle/Chettleo surname first found in Cheshire, the term that I think could have named Cheshire. The Hatting Coat uses garbs in the colors of the Arms of Cheshire! I traced "Cheshire" to Hesse (Germany) an a strong feeling (it was risky), so note that Hesse is said to have been founded by a Catti peoples! The Hatting motto is exactly the Vince/Vinch (Da-Vinci-code important?) motto: "Nil conscire sibi." The Kieth/Maskall motto is "Veritas vincit"!! The Vinces use a mean-looking dragon in Coat and Crest, meaning, apparently, that they own this design. "The [Cheshire] Shield displays the trio of golden wheatsheaves ["garbs"] on blue which have been associated with the Earldom of Chester since the late 12th century...The Crest is a royal [gold = England] lion between two ostrich feathers...The feathers franking the shield are supported by gold lions derived from the arms of the third and fourth Earls of Chester." Clearly, as the lions of England were adopted from the Arms of Normandy, ditto for the Cheshire earls. Ranulf le Meschin was the third earl, and Ranulf de Gernon the fourth. Yet Wikipedia uses a red-on-gold lion for Ranulf le Meschin, though saying that the lion's color is not known. Apparently, the color is known, and was possibly gold-onred. Sufferin' Saratash! This just never ends. I had just recorded a few minutes ago that the Arms of Poitou is a scarlet lion. Purple lions there are, but I've not seen scarlet before. It's as if the color was used as representation for the Biblical dragon, as if the peoples who used it wanted to be a Biblical dragon cult. But that's not the surprise. I then went to seek other Silvan clans, and entering "Silva," a crowned purple lion!!! The write-up traces it to the Burgos and Coruna/Galicia regions of northern Spain. That's where we expect a heap of Saracens as they evolved into, or merged with, Basques, for one. I was just about to write, but decided not to, that the Ares dragon cult can be traced by the name assigned to his daughter, Harmonia, who with Cadmus her "husband" entered Europe as two serpents. I was going to suggest that HARMONia became the Herminone-branch GERMANics while Cadmus became the Catti/Chatti founders of Hesse and/or neighboring Cassel. I decided not to repeat this, as I've mentioned it many times. Then I went seeking more Silv-like terms, and entered "Silver." The Silver/Silber family was first found in Hesse!!! I see the evolution of terms starting from the Tur(r)uku/Turuk(k)u of Arrapha realms: Turuku>Thraco>Thrace(ian)>Saras(en)>Sau>Sav>Savige>Slav(ic)? That was a line to western Europe, but there was a line in the opposite direction into Russia: Thrace>Taurus>Saurus. Think saurus = lizards. Think Sauromatia/Sarmations (Saracen merger with Medes? ), from whom some historians see the makings of the Slavs. It's feasible that Slav evolved from Sav, and Slavic from Savige, but there are other possibilities e.g. Chalybe>Slab>Slav>Silv/Silb. NOW, with "Silv" comes "Calvados" to mind, where the Meschins originated before moving to Britain. The English Calvin Coat is the cross acting as the Arms of Milan, while the Calvi/Calvanese surname was first found in Milan!!! The latter surname uses a Shield of nothing but black and white checks (as occult/Illuminati as one can get), while the Calvin motto includes, "vinces." The French Calvins/Cauvains, named after Calvados (or vice versa), use a Chief with scallops in the colors of the Meschins, the colors of the Russell Chief (! ), suggesting possible links to Sarasins (the surname). The French Calvin Coat uses horizontal martins, which was are about to come across again. The write up says that Calvins "held a family seat in De Cauville, in the department of Calvados, the arrondissement of Falaise in the canton of Thury-Harcourt." "Cauville" smacks of the Covert/Couverte surname (horizontal martins) with leopard-head as Crest!! Recall the Haugh/Hoff surname (first in Cheshire), for I recall tracing the German Hoffs (Leopard-head in Crest) to the Coverts. The Hoffs should trace to Hof on the eastern border of Germany. The point is, the Hedington/Haddington link to the Veres and Meschins; the English Haugh surname was first found in Oxfordshire (symbol = bull, as with the German Hoffs) and, says the write-up the Haughs derive from "the Old German personal name HADewidis" (caps mine). The Belgian Hedde/Heid Coat should be recorded because its white crescents on blue are about to become Sarasin important. NOW LOOK, here is more good evidence that Obama's line to the Scottish/Moray Randolphs is also to the Cheshire Masseys who (I imagine) became Matthies on their way to Scotland. The huge white crescent on blue of the Silvers Coat is used by the Blackwood clan of Lanarkshire. Again, Blackwood is where the Veres trace themselves before ruling Moray, though I was able to show that the Blackwood Veres were from Cheshire Meschins (see first update of February). The Blackwood Shield is a reflection of the Meschin-Shield format to begin with, uses a mascle (= hollow diamond, the Meschin/Masculine symbol), and its essentially the Matley/Matleigh Shield. The Matley Coat? Horizontal martins!! The Matleigh surname was first found in Cheshire. This is IMPORTANT, for it traces Blackwoods to Cheshire, and moreover we're looking for the Silvanians in Lanarkshire, because I've claimed that TranSylvanians came to rule Moray. I'm now showing that those Moray rulers were the Ranulf le Meschin line to the Randolph surname. Note the black crosslet in the Matleigh Coat, a Macclesfield symbol, for the Scottish Randolph Coat uses the white-on-red Macclesfield cross, and moreover uses the Ferrer/Ferrier horseshoes (in colors reversed) in indicating the Vere side of the Blackwood>Moray line. Next, note the write-up, telling that the surname is from "Matlegh," and let me repeat that I traced Meschins to Ligurians when discovering Meschin ties, by another means (I can't recall it), to the Legh surname in their midst. 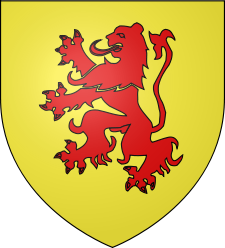 The Legh/Ligh Coat (surname first in Cheshire) is an upright red lion on gold, the lion style and colors used by the Wikipedia article for the Arms of Ranulf Meschin...and the one that became the symbol of Scotland. 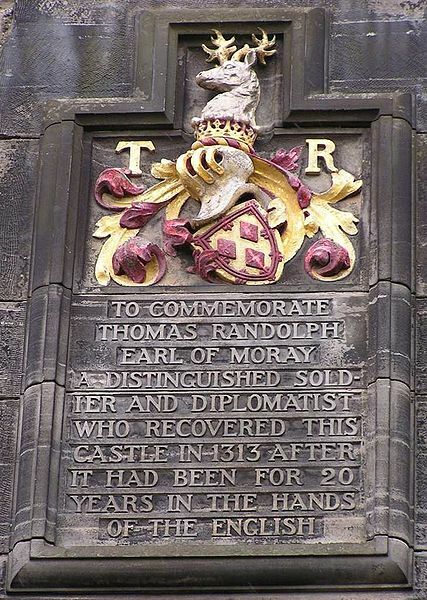 In fact, the Scotland symbol uses the double border of the Scottish Flemings, as did the Arms of Thomas Randolph (from Wikipedia), first earl of Moray, whom I traced (first update of February) to the founding family of Blackwood's Vere-Meschins: Ralph de Vere and his son Thomas. It's likely that the Ligurians were named after a lykos-like term (means "wolf"), and so compare the Legh/Ligh (also "Ley") Crest with that of the WolfLEY (of Cheshire) Crest. They both use arms wearing a striped shirt. Remember that the Biggar surname (first found in Lanarkshire) is a known Fleming surname, and that the double border used by Scotland is known to be a distinct Fleming symbol. See the Fleming border also in the Arms of the Stewarts of Rothesay, and compare again to the Massi/Matti[M]assi Coat, for that surname was, I'm claiming, at the root of the Matleighs and Matthies. I once did a segment (Ladon book) on Lee-surname ties to the Burgess clan that was at the roots of the founding of the Unites States, as per the Virginia Company et al. When entering "Lee," just two Coats come up, the Legh/Ligh Coat under discussion, and an Irish Lee Coat using leopard heads? Coincidence, or are the Lees from Transylvania too? I DID trace both Ligurians and the Poles to mythical Leda of Sparta, which is the next point to be made as per the Massino (interior Liguria) trace to Messina (Sicily), for that latter place surely links to Messene in Sparta, the place to which mythical Menelaus moved, he being made the husband of Leda's daughter, Helen of Troy. I trace Leda's son, Pollux, to the Polish domains. While Poland is not Transylvania, I know that the royals Poles tracing to the Meschins et al were from royally merged with Moravians of Transylvanian elements. Note the motto of the Irish Lees: "Fide et Fortitudine," evoking the Fiddle/Fidelow and Fort clans (= Vere-Meschin-D'Avranches clans). It's similar to the motto of the English Lees/Leghs: "Force avec vertu." The Arms of Oxford, where Veres ruled for centuries, uses the motto: "Fortis est veritas." The Keiths/Maskals of Haddington use "Veritas vincit." What I'm seeing now is that the German Silvers, from Hesse, were a part of the Lanarkshire Vere-Meschins so that the Silver symbol (white-on-blue crescent, an Arab/Saracen symbol too), made it to the Arms of the Blackwood family. It can then be ascertained from the above arguments that Silvers were Saracens involved in the Vere-Meschin jump to Moray, for the French (first found in Brittany) Sarasin Coat is exactly the cross used by the Scottish Randolphs. That was all thanks to watching All In The Family (which should not be a coincidence) when on the topic of tracing Silvans to Flemings. It found the Stive Coat with Moray stars. The Stiver surname is registered under the Sturt surname, as per the Sturtevant variatons. The Sturtevants were first in Nottinghamshire, as was the Bugs surname!! The English Bugs Crest is a bat, but so is the Randolph Crest. The German Bugs' use horizontal martins (in the colors of the English Bugs'). It's a good bet that the Bugs' were a part of the Silvers/Saracen fold, not just because the English Saracen Coat (crescents) is in the colors of the Bugs', but because Bugs Bunny traces to (leopard-using) Schlesinger et al of Transylvanian>Polish bloodlines. The Sarah/Sayars Coat should be related because it's in Sarasin colors (and uses a leopard in Crest). That traces the Transylvanian Saracens to Essex too. As I trace the Saracen fold to Arphaxadites of Syrian Arpad/Arados, the Hungarian Arpads must likewise have been Saracens. The clue is the Arados term, for in Transylvania are Arad and nearby Oradea, but the surrounding Carpathian mountains were surely named by the same Arpad elements. AMAZING!! In the first update of February, the Vere-Meschins of Blackwood were traced to the Randolphs of Moray with evidence from the Carrick clan. In the second update of this month, I bumped into the similarity between "Carrick" and "Sarac(en)." See that the Carrick Coat also uses the Saracen colors. AND, as per the write-up that traces the surname to "Craig," see the white crescents of the Craig Coat! More Saracens!! The Greg Coat; same colors (stork for a Crest). Note that Carricks, using an ostrich, are classified as Strathclydes; the ostrich in Greek is "struthio." The Blackwoods are also classified as Strathclydes. The Carrick Coat used a "Garde" motto term, and the English Garde Coat uses horizontal martins and blacks lions on gold, the same style black-on-gold lions in the Matleigh Coat, WHICH ALSO USES HORIZONTAL MARTINS. And, both Shields use the same colors. The Garde Crest uses the castle design of the Abreus. The Garde motto term, "fidele," links to the wolf-head of the Fiddle/Fidelow Coat (belonging the Cheshire D'Avranches), while the Irish Gardes use the Wolfley (of Cheshire) wolf. It's a shut case; this is Obama central! "A former Iraqi deputy prime minister who encouraged the United States to topple dictator Saddam Hussein said [yesterday] that Washington had interfered in the war-torn country's March 7 general election. Ahmed Chalabi said US Vice President Joe Biden and Washington's ambassador to Baghdad Christopher Hill applied pressure to a committee responsible for vetting candidates and on judges who ruled on who could stand for office. ...However, the latest ruling did not reverse the exclusion of leading Sunni MP Saleh al-Mutlak." How to explain mythical Melusine/Holle in the Massino/Mason Crest. It's telling a story of Meschin ancestry (and history) into times previous to Mieszko I of Poland. The good news is, I was able to link Melusine, who is known to be a Lusignan (France) entity, to Prussia, for her mother was made "Pressina" while Lusatia was in Prussia. In other words, Melusine depicted Lusatia (also "Luzica") as well as Lusignan (the latter peoples are called Melusines). "According to the Anglo-Saxon Chronicle (ASC), Wessex was founded by Cerdic and Cynric, chieftains of a clan known as 'Gewisse'. They are said to have landed on the Hampshire coast and conquered the surrounding area..."
Note in the article that the symbol of Wessex is a wyvern dragon, the Vere species too, for Veres lay claim to Melusine. Note also the Saxon horse that is in the position of the Ferrara/Ferrari horse. Melusine is in the Arms of Warsaw (Poland), and meanwhile Lusatia is on the Polish border, but also in relation to Silesia. Recall now the Schlesinger et-al lines (of Warner Bros.) from Silesia and Poland, and that while on the topic I happened to be watching All In The Family so that I was led to a Stive variation of the Stivic surname of "meathead," whom on the show plays a Polock. The next day, it came to my attention that meathead's wife was Sally Struthers (her name in real life! ), and that clinched a Polish them, for in Greek an ostrich is "struthio." In yesterday's update, the ostrich feather was seen in the Carrick clan of STRATHclydes. But it was also seen (first time by me) in the Arms of Cheshire, beside the gold lion of Ranulph le Meschin. Hmm, the Scottish Masson/Mathieson Coat uses a gold lion, and it is this particular Mathie branch that I suspect was a fundamental part of the Meschin flight from Cheshire to Scotland. Hmm, "All in the Family" even has an Illuminati ring to it, and moreover the show's purpose was to humiliate the rightists Republicans, as played by the hypocritical and racists Archie Bunker, and to esteem the liberals, as played by meathead and Sally Struthers. These findings are beginning to raise suspicions that All in the Family is a Polish creation. The show was created by Norman Lear, while there are similarities (especially the gold thingie) between the Lear Coat and Struthers Coat. The blue lattice in the Struthers Coat was just seen in yesterday's update, in the Irish Taffey/Taffie/Taaf Coat! We saw that the Taffie Coat, without the lattice, is the Macclesfield (Cheshire) and Piedmont cross, while the Welsh Daffy surname was first in Cheshire. All in the Family, therefore, starts to look like a production of the same bloodline(s) that brought about the Meschins, Pollocks, Rutherfords, Sarasins, etc. As per the Eburovices-of-Evreux topic of yesterday: "This [Lear] surname was originally derived from the Old French de L'Eyre, a reference to a place in the arrondissement of Evreux in Normandy." That smacks of "Ayr(shire)," which is conspicuous because "Elmer" was traced to Ayrshire's previous name, Ale(shire). Entering "Eyre" brings up the Ayers Coat. I think a good clue for zeroing in on Melusine elements in Scotland is the fact that the Elis surname used her, with mirror and red fish tail, in a Crest, wherefore the Ale term comes to mind. The Alis surname may apply, as it uses "Vincit veritas" while the Keiths/Maskals use "Veritas vincit." The Alis Crest uses a hawk, a symbol that might end up linking to the Hykes surname of Arthurians importance. Elmer Fudd was a hunter, who hunted Daffy Duck. Note that the Irish Taffies likely link to the Daffies because Taffies were first found in Welsh Pembroke (ruled by Strongbow Clare). PLUS, I trace "Pembroke" to Bamburgh of the Bebbanburgs (as per queen Bebba of the Bernicians), while the German Babel Coat uses Melusine i.e. this goddess has got to link to both the German and Bernicians Babenbergs/Bebbanburgs. The Struthers motto includes a word translating into "hawk," as well as the term, praedam, which should link to the Pratts (from PodeBrady, Bohemia, south of Lusatia) with whom the Bruces merged. For the Massin/Mason Coat uses a blue lion on gold that was linked to the Bruce lion when it was in Bruges, Belgium (it's the Belgian Pratt Coat that is identical to the Scottish/royal Bruce Coat. PLUS, the (English) Massin/Mason motto is, "Dum spiro spero," which should be code for the Speers and Sprees, both using the same-colored crescents...and traced (by me) to the Spree river, Lusatia!! That, in a nutshell, explains Melusine in the English Massin/Mason Crest. The crescents make one suspect that the Sprees (and Massins/Masons) link to the Sarasins. Note that the Scottish Masson/Mathieson Coat uses a "Spera" motto term. THEN, as per the "simple" motto term of the Sprees, we take a look at the Simple Coat to find more lattice (in the colors of the French Cottes, this being exactly the Struthers lattice design). Meathead has a Reiner surname in real life, so see the Zionist star and the blue/white lion on white/blue of the German Reiner Coat. The surname is also "Rainer," very interesting indeed because the Veres link their early Melusine-of-Anjou to a certain Rainfroi. AND, "Renfrew," where the Pollocks (the surname) and Speers were first found, looks like "Rainfroi"!! The Rainer surname could even modify easily to/from "Ranulf." The Speers use the Fleming colors, and both Flemings and Ayrshire use "shaw" in their mottos...which term could trace to the same-colored Chee surname that may have named "Che(shire). The Ayers/Eyres were first found in Derbyshire (beside Cheshire), to which I traced Traby-Poles	who, like Ranulf le Meschin's Cheshire, likewise use ostrich feathers!! Perhaps the Cheshire feathers belonged to Ranulf himself. Assuming that the Chees developed a Cheddar variation as per "Cheshire, the Cheddar Coat was checked, to find scallops in the colors of the Meschins (and Flecks). As per the Matleigh surname discussed in the past two days (with the suspicion that it links to the Mutlaq and (A)Fleck surnames of Baathist entities), I should add that Matlocks were first in Derbyshire. Although the Pollocks and several of their related clans have been found to be overwhelmingly Saxon (think Lusatian), neither the Meschin nor Massin/Mason write-ups link to a particular peoples. BUT, the Scottish Masons/Mathies are traced to Gaels i.e. Irish founders of the Scots, while the Keith/Maskals are traced to Picts. That makes sense because Picts were a part of the Cruithne wave from Ireland to Scotland. As we discovered the Keiths/Maskals to be a Vere line to the namers of Cheshire, I would now venture to trace Meschins to this Cruithne-Pict family of peoples, which is where the dragonline Veres link Melusine, you see. The mystery is that Melusine is fundamentally a Lusignan and Lusatian peoples so that we can assume a Lusatian merger with Picts...when the Lusatian Poles arrived to Britain. I would peg them arriving as the Saxons due to the Kwisa similarity with "Gewisse." At that time, king Mieszko was not yet born, but he was born (early 900s) in time for the naming of "Makeslesfield." Note the "les" term next to the Makes/Maccus term, for I trace Leslies to "Lusatia." It's very clear to me that the Scottish Massons/Mathie(son)s trace to the Irish Mathuna surname first found in County Clare, for the English Mathies/Mathesons use the Clare triple chevron in colors reversed. What I'm trying to say is that king Arthur's (not a real person, but code for the Arthur/Clare family) ancestry in the Gaels is starting to look as though it was in the ancestry of the Mathuna family of County Clare. It would explain Arthurian elements in Cheshire and Salop/Shropshire, where the Meschins were became powerful. I'm suggesting that the Irish ancestry of the Cheshire Meschins and that of the Arthurian cult was one and the same. The Mathuna clan is said to be named after a bear, the animal that many say depicts king Arthur. The write-up: "...'mathghamhan,' which means 'bear.'" Assuming that the pre-king-Arthur-period clans derived a bear theme (because Arthur-like terms sounded like "bear" in Welsh), it then modified to "Mathghamhan" when a branch lived in Ireland. Marital mergers between the two branches could explain why the Arthur-surname write-up traced to the Irish-Scots in the Hebrides. BUT, ultimately, the king Arthur cult should trace to the founding of the Brits via the Cruithne of Ireland. Look at the evolving Arms of Britain. Scroll down a bit until your see the Arms of Richard I, two lines facing one another. It exactly the lions in the Abreu Coat. It suggests that the Brits were named after Aprutium (capital of Abruzzo) and/or their Bruttium branch. The problem is, "Brit" is said to derive from a P-Celt version (i.e. "Pretani") of "Cruithne." More likely, there were two branches with this C-versus-P difference before they arrived to pre-Britain. For example, there were the Curetes and the namers of Aprutium; a translated page says that the "Praetutii were an ancient Italic people settled in the first millennium BC in Italy Central...," and that they had a Phoenician origin. There's likely more known about this Phoenician history than the writer(s) is letting on. The Curetes fit that ancestry, for they were the essence of the Zeus-Taurus cult, and Zeus was from Tyrus, of Phoenicia. In myth, "he" came to Crete with Europa, no doubt the "Ebropa" ("opa" is a suffix) that modified to, or at least linked with, "Aprutium." Did you notice the Pratt-like "Praetutii"? It explains why the Pratt surname linked with the Bruces. I tend to think that Aprutium links with Epirus so that a line was like so: Eur(opa)>Epirus>Aprutium (this line could have been from Crete through the Hebros/Evros river, Thrace). The Bruttii may have been a separate Europa branch developing into mythical Britomartis (of Crete). That's the line to which I trace Arthurian Brits, though the Abruzzo sector merged, and/or fought wars, with it. As we can now suspect that Cheshire links to the Catti of Hesse-Cassel, a check of the Cassel surname is in order. The German Cassels use the red triple chevron on gold, the Clare and Burgh symbol. As per the Buro surname being a variation of the English Burghs, we realize that Burg(h)s could have been named after the Ebroicum/Eburovices founders of Eburacum/Eboracum (York). That idea eluded me until yesterday. The English Casselman surname uses the Abreu castle! As we can see that the Casselman surname uses a Cashman variation, so the Cashman surname is found to be a variation of the Kissane/Guisane family...that should link to the English Cassane surname using a red triple chevron on white! The Cassanes also use an "alis" motto term. And, the write-up seems to link to the Catti of Hesse-Cassel: "First found in Hampshire, where a Ralph Cattessone was on record in 1115." Again, the Cassane Crest is the Moreno/Moratin castle linking to Moors/Mauritanians, a topic to come up again below as per the Arms of the present pope. The Scottish Cassel Coat shows fairly obvious links to Cheshire, not only the black crosslets of the Davenports, but the dolphin (i.e. Daphne, as per Deva, early name of Cheshire), and the red and white colors of the Chees/Cheatleys/Cheddels. If we can agree to a "Cheatle/Cheddel" link to the Catti and "Cassel" elements, then the key-symbol in the Cassel Coat is evidence that "Chee" is indeed rooted in "key" and key-using families such as Chavez>Sheaves>Shaw, Caves>Cellar>Keller>Kelner, and Cluny>Loonie. The Scottish Kellers of Angus -- near the Cellars (Aberdeen), the Clunys/Loonies (Pertshire), and Shaws (Perthshire) -- are said to be STRATHclydes. The Clunys/Loonies are said to be from Picts. As we saw a blue lattice symbol yesterday in the Struthers Coat, so now see another entire Coat of just the same lattice in the Caves Coat. "Cave" is from "Chaves," no doubt, for "Keller/Kelner" is from "cellar=cave." The English Kelners and the Caves were both first found in Lancashire. But there is another surname using keys, the Barnier (in the white-on-blue colors of the Cluny (France) key). Oh, and yes, also the mascle-using Betty/Beaty, by which I mean to repeat that the Barnie and Betty Rubble cartoon characters depicted a part of the key-using clans. Well, Barney (dressed in brown) suggests a link to Luneburg-Brunswick so that the Loonies/Clunys (also "Lunny") should derive from Luneburg, or vice-versa. I also trace Barney elements to the bear symbol of Berne>Bernicians (Bernicians, of Brynaich, are linked, by me, with Brunswick). I then link Arthurian elements with the Bernicians, for the Arthur surname was first in Berwickshire. Note that the bear in the Arms of Berwickshire is under an ELM tree. Hmm, Elmer? Berwickshire was smack in the land of Brynaich/Berneich. Note the makings of Strathclyde next to Brynaich, and that the latter country verged into East Lothian where the Keith/Maskals lived. It's a no-brainer: king Arthur was linked to Bebbanburg>Babenberg elements...that later became mythical Melusine of European mythology. I tend to identify Melusine as the Khazar/Cohen/Fer line of historical Melissena Rangabe (about 850 AD), meaning that Cohens came to live in the realms belonging earlier to the Bebbanburgs. That is, Melissena-based Cohens/Fers merged with the remnants of the Bebbanburgs of Bamburgh castle. But it's not only the Cohens and Fers who use blue and white checks, for the Massi/Mattiassi family also uses them. Note that the Fers were first found in Brittany, for the Stewarts also came to use those checks. Compare the Irish Looney stag to the red stag in the Irish Kissane Coat; both surnames use "fideli(s)," the term that got me to Elmer Fudd in the first place...and the subsequent revelations about the Loonie Tunes crew. As I trace "Elmer" to the Ale river in Roxburghshire (though also to Ale of Ayrshire), note that the Betty surname (blue keys on white) was first found in Roxburghshire. The Ale surname uses blue and white too, and may link to "Alan." Roxburghshire is at the south end of what was Brynaich. I'm thinking that Roxburgh was founded by the blue and white Rock/Rocque surname of Languedoc, the proto-Rockefeller clan. As per the very interesting discovery below on ravens, keep in mind that the German Rothes use a crow/raven, while the Rother variation, said to be from Silesia in particular, should link to the Rutherfords of Maxton, Roxburghshire. The English Rothes/Rothams were first found in Salop (Shropshire), who evoke the Meschin write-up: "There is also a vague [not really so vague] relationship [of Cheshire Meschins] to Robert of Rhudlan, kinsman of Duke [Conqueror] William." AND, there is a Rutter/Rudder surname using garbs, the Cheshire symbol, because the surname was first found in Cheshire. One could get the impression that Rhudlan was from the Rothers of Silesia, and the proof should be below wherein the crow/raven symbol seems to link directly to Ranulf le Meschin's ancestry. The Arms of the present pope, as with the Arms of many popes, uses keys in saltire, and although they are said to depict the keys of Heaven that Jesus granted to the apostle Peter, I wonder instead about papal links to the key-using families. The pope's Arms uses a Moor-head, about as Christian as the devil. The Arms also uses a scallop, which I think links to Meschins. Then there is a saddled bear in the Pope's Arms, which is why I came to his Arms in the first place, for at the time I was on the bridled/harnessed bear of the Alis/Alais Coat. The page on the present pope tells that his saddled bear is from the Arms of St. Corbinian (Bavaria), and then we find that the Corbin Coat used the very same crow/raven as found in the German Rothes/Ruther Coat, in the same colors to boot. It's the same Coat exactly, and the Corbins were first found in Shropshire !!! (i.e. as were the English Rothes). As per the discussion below, know first that the pope's name at birth was Joseph Alois Ratzinger. I am stressing the "Rat(z)" part of his name, as that could link to the roots of the raven symbol. But what of the coincidental similarity between Alois and Alis?? Then there is the Z/Singer ending of his surname that may link to "SchleSINGER" (from "Schlesen/Silesia"), and possibly, the Singletary surname that changed to "Dunham." English Singers use garbs, and German Singers (first in Bavaria, like the pope) use a bear. The Randolph surname comes from the raven term!! After seeing the Corbin crow above, I thought I had better check the Raven surname. Seeing (in the write-up) a derivation from "Hreoefn," which so smacked of "Ralph" (a Ranulf version), the Ralph Coat was checked, half-expecting ravens. Unfortunately, the Scottish Ralph Coat, though using the same colors as the Corbin Coat, didn't use ravens, but so-called water carriers instead (Banister symbol), BUT, zowie, the English Ralph Coat...ravens!!!!! It's said to be derived from the Norse, "Randolph." It roots "Randolph" in "Rad," reflecting "Rat(zinger)," but I think there is an older "Ran" root in the Rani Polabians. Were the Rani a part of the Rangabe family, since after all multiple Polabi entities end with "abi." Plus, Melissena Rangabe was married to Inger the Varangian, while Ing entities, for example the Angles (thought to be of the Ingvi family of peoples), lived smack in the Polabian theater. I would have no problem linking the Vere-ish "Rainfroi" to the Ingaevones because they were related to mythical Frey. Quite possibly, Renfrew was named after Rangabe>Rainfroi elements, therefore. The Corbin crest is an elephant, as is the Maskal/Mascall Crest. The Corbin elephant is identical to the Cobbs-Crest elephant except that the Corbin one is harnessed (!) and, apparently, saddled (! !, meaning that we have found the Corbins of the St. Corbinian family). Thus, the Shropshire Corbins must link to the Meschins...and the Banisters that are said in the Meschin write-up to be of Shropshire elements. As per the "corvos" motto term in the Corbin motto, the spelling was checked to find the very same crow in the Italian Corvo/Corvin surname! "First found in Abruzzi...The Corvo family were the barons of Cerviglione..." The Corvin surname is traced to "raven" (though in Greek it also means "crow"), and the Coat is in the same colors as the French Corbin/Corbette Coat...using ravens. The same colors are used in the Rat/Raith Coat (using the Sinclair/Macclesfield/Rhodes cross). "Spero" is used in the Rat/Raith motto, suggesting possible links to Lusatia's Spree river and therefore to the Silesian Rothers. I've been keeping an hawk's eye out for the Massi-Chief eagle design, since after all I'm hunting for Ratz too. It's a peculiar design with the head of the eagle stretching to the left, an easy design to spot. I've found it for the first time in the Ratz Coat, though the surname is more properly Rasch, apparently. As the surname is traced to locations such as Rasch or Raschau, the German/Austrian Rausche/Risch/Resch surname (crossed arrows, pointing down) might apply. There is a Ruskie/Ruskin surname (first in Perthshire) using arrow heads (officially "pheons," no doubt a Phoenician-ancestry symbol) pointing down. Entering "Resh" brings up "water carriers" in the colors of the Ralphs, though this surname is properly, Rose/Roose/Ros! Ralph/Rollo the Rus viking comes to mind, but note that these were first in Yorkshire, where the Banisters ended up too. The water carrier looks like an 'R', slightly anyway. This possibly link to Rollo is important because there were raven-symbolized vikings (Stout surname) in Shetland (northern Scotland) that were raiders/conquerors of Rothesay (western Scotland)! I had traced them back to the Polabians about Mechlenburg and Pomerania...while the Ratz/Rasch surname was first in Pomerania! This is very good, for while I identified those raven-depicted vikings as one side of the proto-Alan>Stewarts of Dol (though at the time I couldn't be sure of a link to Rollo's vikings), the Massi Coat (the one using the Ratz/Rasch eagle) is a virtual copy of the Scottish Stewart Coat. This verifies what I concluded recently, that the proto-Stewarts of Dol were linked to Massino Visconti...about which the Massi surname was developed. Here's what I'm thinking, that the Rani Polabians were the Rangabe-family (blue and white) Cohens to blue and white Shetland, where a unicorn was used, a symbol also found in Cheshire's Macclesfield Crest. Compare "Shet" with the "Chettel" surname of Cheshire (! ), as if Cheshire and Shetland had the same roots. The Rangabe-Rani then founded the Norse surname, Ranulph/Ralph, after their raven symbol, and that's the name used for the Cheshire Meschins, suggesting Meschin links to the same Shetland/Rangabe vikings. BUT, the Polabians trace to Poland, and likely to the Moravian-Poles. Rollo's father, Ragnvald, was likely from the Rangabe Polabians, therefore, keeping in mind that the Norman Rain surname is said to derive in "Ragin." See the raven in the Arms of Shetland, but then read the "Skal-land" term, what could have created the Meschin scallop symbols. The two dolphins in the Shetland Crest could then link to the two dolphins in the Durham-surname Crest. This Durham link to Shetland is brand-spanking new this minute. The last time that I stressed the Arms of Shetland, I traced the vikings thereof to the Drummond family, so note the "Durrame" and "Dirom" variations of "Durham"! Seeing the red crescent in the Durham Coat, compare it with what looks like a red crescent in the Shetland Arms, directly above the word, "Med." Durhams were first found in DUMfriesshire (Dum-Frey?). The Wren surname write-up: "First found in Durham where they held a family seat from early times, and were originally descended from Ralph de Raines..." Why Ralph? The Coat is said to use three wrens...but they look like ravens (too small to make out). The Wrens "were originally from Rennes in Normandy ." AMAZINGLY, these Durham (proto? )Drummonds can be traced to Aprutium's founders, the Praetutti. I've learned this just now. First, we note the Durham motto, "Fert," and then check for links in the Fret surname, which is registered with the Farr clan. The Farr/Fret Coat is a saltire in colors reversed from the Belgian Pratt/Praet Coat. That's just the first clue. The Fret Crest uses the M-shaped cloth that is a symbol of Leicestershire (from the Hastings in Leicestershire). NOW, the "animus" motto term of the Durhams should link with the Cope surname because it uses "animo," and moreover the Copes/Copps were first found in Leicestershire. Both the Copes and the English Pratts use a wolf-head. The Copes motto includes, "Aequo," smacking of Aquila, current capital of Abruzzo. Aprutium, the ancient Abruzzo capital, is now Teramo, which I claim links to "Drummond" elements. 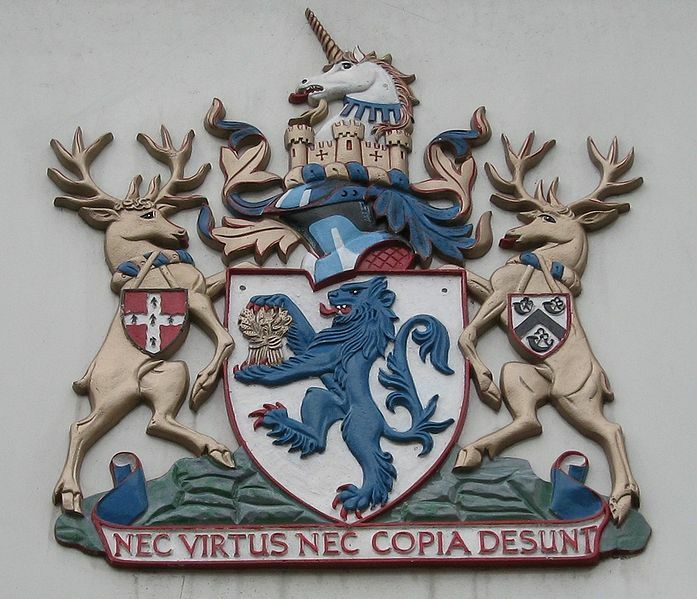 The Copes surname should then link to the "copia" motto term in the Arms of Macclesfield Borough, especially as the Drake Coat (links to the Italian Muscas surname) uses the motto, "Aquila non captat muscas." The captat term smacks of the Capite term found in the Meschin-Coat page. As further evidence that Drakes link to Abruzzo elements (i.e. the Ebroicum Celts), Drakes and English Burghs were both first found in Hampshire while the Burgh motto also uses "animo." Then, zowie, the idea of trying for a Nimo Coat came to mind as that last line was finished: it's the Belgian Pratt Shield (!!!) with possibly the red crescent of the Durham Coat!!! !